black walnut wood is world wide famous as this material is commonly used on interior decoration such as wall panel,flooring,furnitures etc. Solid hardwood American walnut demand is less than engineered American walnut because of its high cost. Solid American walnut wood is only used on some very luxury project,like private villas or some goverment projects. C&L hardwood supply American Black Walnut flooring both in solid hardwood as well as in Engineered with 2mm-5mm toplayers. We need make a cliam that American Walnut is seldom to supplied with Premier Grade flooring,as this wood in bulk quantity always come in ABC Grade sawn timber. If a must,the clear grade Walnut better in engineered timber flooring. C&L hardwood supply solid Varnished American walnut in size: 300-1200x90/120x18mm both Prefinished & Unfinished. 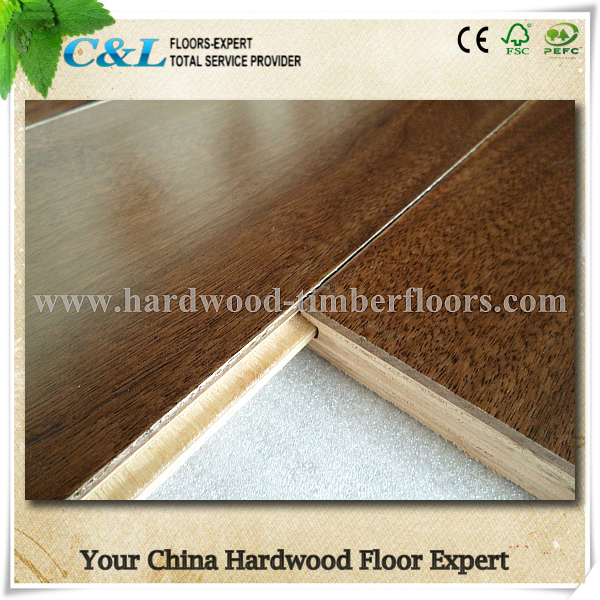 Engineered Walnut timber flooring : 910-1210x125x15mm/pcs.